For every day cleaning use a soft sponge or dishcloth with warm water. For stubborn or greasy clean-ups use a gentle liquid cleaner like Mr. Clean, 409, Simple Green, Fantastic etc. or ordinary dish washing detergent e.g. Palmolive with warm water and a “White Scotch Brite”. Never use red or green Scotch Brite as they contain aluminum oxide (the same abrasive in sand paper) and may dull finish. Do not use abrasive cleaning agents such as regular Comet and Ajax. If needed, Bon Ami and Bar Keepers Friend are both approved non-abrasive cleaning powders that will clean without affecting finish. Though most common household cleaners have no effect, never allow your countertop to come in contact with drain cleaners, paint strippers or products containing Hydrofluoric acid, Methylene chloride, Trichloroethylene or any product with a very high or very low PH. These types of chemicals may etch or discolor the surface. There is no need to seal your countertop. Sealers cannot penetrate and remain on the surface. Eventually the sealer will start to wear off unevenly in high use areas causing the polish to appear inconsistent. 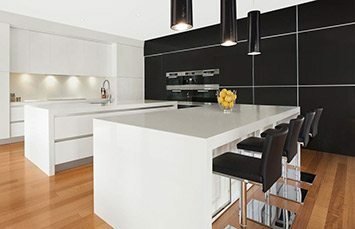 Natura Quartz is scratch resistant and under normal conditions is not affected. Always use a trivet or hot pad between and any heat generating device including but not limited to crock pots, deep fryers, hot pots and pans or electric skillets. Sudden or rapid change of temperature or sustained heating, especially near edges and cut outs, may create enough thermal expansion energy to cause your countertop to crack. Damage caused by thermal expansion is not covered under the warranty. Follow these simple care and use guidelines and your countertop will provide you with many years of trouble free use.